Eveleth Merchant Association welcomes Cold Snap Technology. The Association members in the back row are: Paul Muhich, Kevin Keanan, Ashley Carlblom, Jaimie Lindseth, Vickie Tuskan, Lindsey Burgau, Linda Kohlhase, Gary Skerjance & Rolf Widstrand. 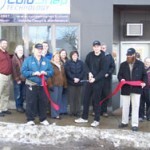 Dustin Miller cutting the ribbon at the Grand Opening Ceremony of Cold Snap Technology’s Eveleth Office location. Pictured in the first row are Cold Snap Technology’s Edward Addy, Dustin Miller, Ben Marolt, & Zach Rager hiding behind Ben. Dustin Miller has cut the ribbon held by Ben Marolt & Edward Addy at the Grand Opening Ceremony of Cold Snap Technology’s Eveleth Office location. Cold Snap Technology has been around, in one form or another, for the past ten years, with roots in Aurora, Biwabik and Embarrass, MN, currently located in Eveleth, MN providing a variety of computer services from pc repair to website design. Edward Addy started Northern Visual Services in 2002, with his wife Rebecca Addy. The company builds websites for anyone who needs a website. Tim Carlson & Dustin Miller were hired shortly after the creation of Northern Visual Services. They build the company up to over 60 clients over the next 3 years. At the start of 2005 Dustin Miller left Northern Visual, but kept very close to Edward Addy and did some sub-contracting for Edward. After leaving Northern Visual Services, Dustin started Cold Snap Technology in Embarrass, MN. The company got its name after Embarrass had a nearly 60 below temperature. The primary focus at this time for Cold Snap Technology was doing computer repair, and a couple websites. Websites became a bigger focus later on, but computer repair is still a major portion of the business. Cold Snap Technology was one of very few locations that would actually make a house call at affordable rates. Toward the end of 2006, Dustin was approached by the World Junior Curling Club Championship website for the 2007 championship. At that time, Dustin sub-contracted Ben Marolt to help him with the programming of this website. This website allowed people to view live scoring across the world for their Curling Championships. At one point, there was so much traffic (around 1 million hits) that it took the server down for a short time. 2008 brought on more major changes for Cold Snap Technology & Northern Visual Services. Edward Addy mentioned selling his company, and Dustin was interested. Dustin Miller then talked to Ben Marolt about forming a partnership and buying Northern Visual Services. Then June 24, 2008 Cold Snap Technology officially purchased Northern Visual Services from Edward Addy. Northern Visual Services was then merged into Cold Snap Technology. Since 2008 Cold Snap Technology has grown to over 150 web and computer repair clients. 2011 was another expanding year when Dustin Miller and Ben Marolt decided to bring Edward Addy back as a limited partner and for sales and public relations. It was decided that it was now time to move out of our garage office, and time to get a storefront, so on December 1, 2011 Cold Snap Technology moved to 410 Jones Street in Eveleth, MN where we currently reside. Here we are doing computer repairs and web-design.